This is my STL-3T (T for tapped) pickup; I call it the Quarter Pounder. 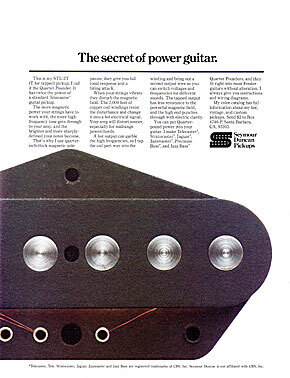 It has twice the power of a standard Telecaster* guitar pickup. The more magnetic power your strings have to work with, the more high-frequency tone gets through to your amp, and the brighter and more sharply defined your notes become. That's why I use quarter-inch-thick magnetic pole pieces; they give you full tonal response and a biting attack. When your strings vibrate they disturb the magnetic field. The 7,000 feet of copper coil windings resist the disturbance and change it into a hot electrical signal. Your amp will distort sooner, especially for midrange powerchords. A hot output can garble the high frequencies, so I tap the coil part way into the winding and bring out a second output wire so you can switch voltages and frequencies for different sounds. The tapped output has less resistance to the powerful magnetic field, and the high end punches through with electric clarity. You can put Quarterpounder power into your guitar. 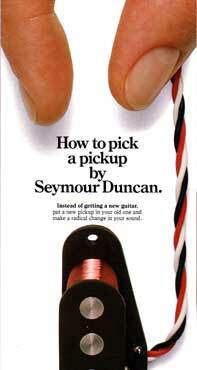 I make Telecaster*, Stratocaster*, Jaguar*, Jazzmaster*, Precision Bass*, and Jazz Bass* Quarter Pounders, and they fit right into most Fender guitars without alteration.